Niger has been on Americans' radar lately, thanks to recent events. But if you sort of paid attention in your world history classes, you already know a lot about the country. Today's Niger straddles the Sahara desert, formerly the heart of the Songhai, Hausa, and Mali empires and an important site of the expansion of Islam in West Africa. (You can take me out of the classroom, but...) There's a lot more to learn about a patch of the planet than its relation to American imperial interests, so keep your ears out. One way to expand your horizons is, of course, through music. 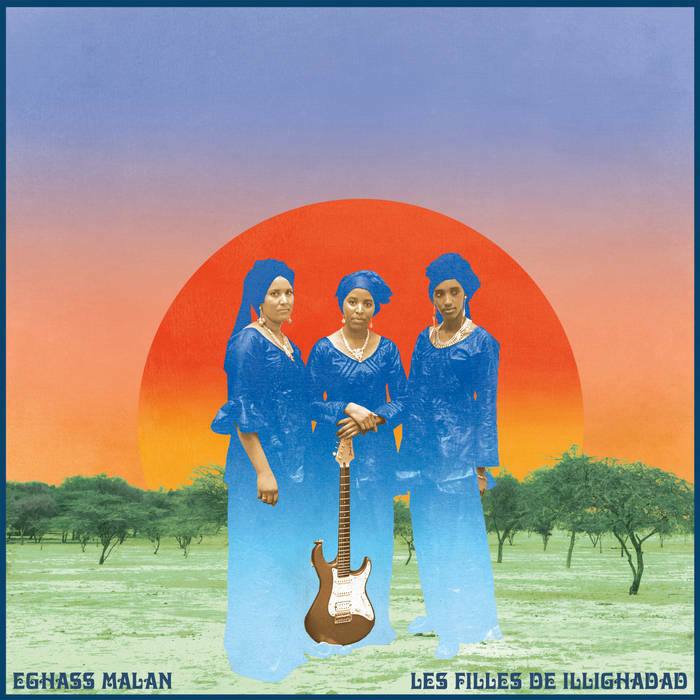 Les Filles de Illighidad ("the girls of Illighidad") are expanding the boundaries of traditional Tuareg music. You might be familiar with Tinariwen, who hail from the neighboring Mali. Les Filles are following in their footsteps while forging ahead. Tende music, the genre both bands play in, was originally meant for women to play on a drum made of a mortar and pestle. As Mali and its neighbors urbanized in the 70s, men substituted women's vocalizations with the sound of guitars. Les Filles bring it full circle, establishing themselves as the only women playing tende music with a guitar. If you don't subscribe to She Shreds already, you should. In this interview from February, Fatou Seidi Ghali hints at the barriers she and her cousin Alamnou Akrouni have had to push through to play guitar in public at all, let alone earn money in exchange for their art. Eghass Malan is the band's first studio-recorded album. Any appreciator of guitar-driven music while marvel at Ghali's fluid technique. The guitar and tende create an organic wall of sound as the women's voices weave in and out of chorus and harmony. There's an intimacy and trust in these recordings that is virtually impossible to capture. Even if "world music" isn't "your thing," it's worth a listen just for that. Eghass Malan feels more like a field recording than not, but that's okay -- Les Filles have a spontaneity that most road warriors can only dream of.